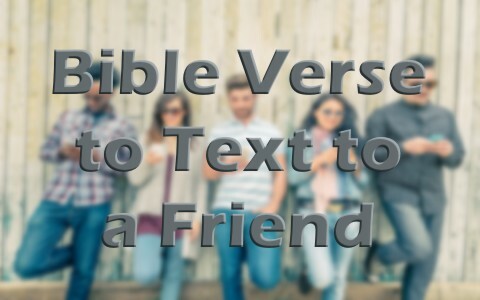 Here are ten great Bible verses to text to a friend who is struggling. When the Apostle Paul says that he is sure of something, we might want to underscore what that is. In this verse, Paul had assurance that God, Who “began a good work in” Timothy, was going to “bring it to completion at the day of Jesus Christ.” What God commits to, God completes. It’s as if God firmly holds our hand (John 6:37-39) until we get there safely. What God starts, God finishes! Text that to your friend. If it were us who established ourselves with God, then none of us could have any real assurance, but when it is God Who establishes us “in Christ,” that means He’s also “put his seal on us,” and this seal was given by the Holy Spirit, seals us unto the day of His appearing. The Holy Spirit should witness with our spirit, that we are the children of God (Rom 8:16). Isn’t that encouraging? What an uplifting chapter Isaiah writes here (43), and although this was written to Israel, would it not be just as true for the believer in Jesus Christ? God told them (and us), “Fear not, for I have redeemed you; I have called you by name, you are mine” (Isaiah 43:1), and even though your friend might not feel like its true, text them where it says, “you are precious in my eyes” (Isaiah 43:4a). That’s what friends do. The word for “consider” is more of a mathematical or accounting term than it is thinking or reflecting on. Paul would love the idea of opening a ledger, then putting down all of this present, evil world’s suffering, including our own suffering in the debit column, and then in the credit column, all the glory that’s going to be revealed to us someday (Rom 8:18). Paul’s conclusion should be ours; it’s no contest. The eternal and timeless joy and seeing the glory of God, is so far greater than the tiny speck of time we suffer today. That’s why Paul was sure that no matter what happened in this life, everything will ultimately work out for our very best (Rom 8:28). We have God’s Word on it…and that’s enough, isn’t it? It’s easy to rejoice during good times, but it’s very hard to rejoice while you’re suffering. If you think of it this way; suffering makes us have greater endurance for suffering. Endurance produces godlier character. This battle-tested character produces hope. And this hope, in the end, tells us, we don’t have anything to be ashamed about (2nd Cor 5:21). Can you see the chain reaction? Jesus told His disciples long ago that they couldn’t do anything without Him (John 15:5). Nothing is not a little bit of “something.” It’s nothing or something and it is only through Christ that we can do anything but that’s only because it is “through him who strengthens me.” It’s not a self-help, but a God-help. Through Him, all things within His will are possible, but not without Him strengthening us. At one time, Ancient Israel were strangers in a foreign land (Egypt), and it was only until He brought them into the Wilderness did they finally know Him. They weren’t separated from Him anymore. That’s because He called them out of Egypt, just as He calls us out of our own Egypt of sin. We used to be foreigners to God and His natural enemies (Rom 5:6-10). At that time, if you can remember, you were “having no hope and without God in the world.” How miserable was that!? I remember. Thankfully, we are brought close to God by Jesus’ own blood. Having a bad day? How about your friend? Why not text him or her this verse? This verse might help them deal with today by thinking about tomorrow…at least knowing that this will all be behind them someday. Part of the reason there’ll be no more mourning is because deaths finished! No more pain or crying, because sin’s banished. All those things “have passed away” by then. Praise God. What a future. This was the Apostle Paul’s last letter. It was written just before he was beheaded. Timothy must have known this was his last letter because of what Paul wrote (2nd Tim 4). In fact, by the time Timothy got this letter, Paul could have already been martyred. That makes these last few chapters of Paul’s letter so precious. It’s like his “last will and testament” or a “living will.” I believe he was trying to reassure Timothy, who must have been shaken by his mentor’s impending death. In doing so, Paul writes to Timothy that He knows the God whom he has believed from experience. He has served that God, suffered for that God, witnessed for that God, and been beaten, whipped, and stoned; once presumed to be dead, yet Paul believed God through all of it. That’s why he told Timothy that he was persuaded by God that He was able to guard his soul until the Day of Christ’s appearance. What God entrusted to Paul was the Holy Spirit, and Paul knew He guarded him till the end. He wanted Timothy to know the same thing. It is not just for Paul or Timothy, but for everyone who’s trusted in Christ, He will guard them or hold them safe and secure until that Day of Christ’s visitation, or at our death (whichever comes first). Do you have a friend who could use encouragement? Even if they’ve blown it big time, remember your role as a friend; “A friend loves at all times, and a brother is born for adversity” (Prov 17:17). That’d make a great text to send to a friend who’s really struggling right now. Are you a friend of someone who you’re especially close to? The Bible teaches that “there is a friend who sticks closer than a brother” (Prov 18:24b). Is that you, or don’t you have that type of relationship with a friend yet? Don’t have a friend? Be a friend! Previous post: Is Paradise And Heaven The Same Thing When Used In The Bible?